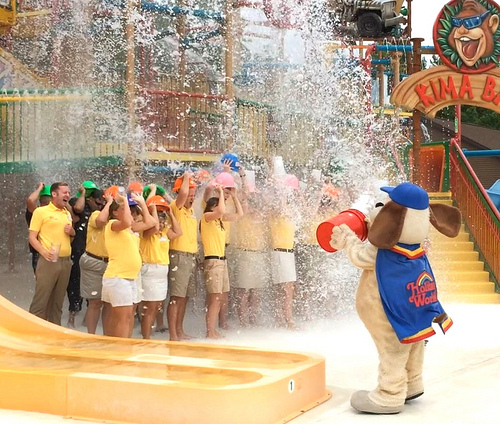 Holiday World park owner Leah Koch was personally challenged to the ALS Ice Bucket Challenge and nominated some of Holiday World’s Staff to take part in the challenge. Staff members at Holiday World gathered under their 1,200 gallon dumping bucket in Kima Bay where they would all eventually get drenched with ice water. The ALS Ice Bucket Challenge is a viral movement that challenges people to spread awareness about ALS (Amyotrophic Lateral Sclerosis), a disease that affects nerve cells in the brain and spinal cord, eventually causing paralysis and death. More than 30,000 Americans have ALS at any given time. The Ice Bucket Challenge involves people getting doused with a bucket of icy water on video, posting it to social networks, and nominating others to do the same. People can either accept the challenge and douse themselves with icy water or donate to an ASL charity (or do both!). Holiday World has completed the challenge and nominated four to complete the challenge: Dollywood, Kings Island, Six Flags St. Louis, and Silver Dollar City. For more information about ALS, visit this website for more information.